One of the the things that we do as teachers is tell stories. We share so many stories on a daily basis. It is what we do as teachers. It does not matter on the type of stories that we share. Short stories, long stories, real stories, made up stories. You name it we tell stories. We tell stories for fun; we tell them for reflection purposes; we tell them to share our point of view or someone else’s point of view; we tell them so that we or others can begin to build explanations or make connections. Stories are fundamental to our and others understanding. Sharing stories is a great way to learn. It is a great way to collaborate. It is a great way to connect. But there is also science behind it. you are literally using more of your brain when you are listening to a story. And because you are having a richer brain event, you enjoy the experience more, you understand the information more deeply, and retain it longer. School life is busy. It can be hard to find the time to share stories form our learning spaces. It can be challenging to carve out the time to share what went well or what went badly in our classrooms. But sharing stories is fundamental to education. It is the stories (both short and long) which moves the thinking and learning forward in our schools. It is the stories that build relationships. It is the stories which create and define a schools culture. These can be books. There are so many awesome books to read to and with students. Here is one of my favourite books to read in class . Lost and Found by Oliver Jeffers. They can be stories that a teacher has created or borrowed to share some information or build curiosity. It is in our nature to tell stories and inform others of our life events. Storytelling, whether factual or fictional, is an intrinsic human characteristic. This is the Campfire element in the classroom. These are the stories which students share with us. They can be short or long. They can be at any time in a day and it is crucial that as teachers we tune into them and are ready to listen actively to what they are telling us. It is a way of listening and learning from our students. Listening closely will build trust and our relationships grow. I am talking about the types of conversations about our practice, about pedagogy, about the things that we have learnt or tried in our classrooms recently. Sharing these stories makes a difference. It makes a difference to the person telling the story as they reflect meaningfully on what was happening. It makes a difference to the person listening as it gives colleagues ideas and allows them to make connections to things that have been happening in their learning spaces. These are the stories that build a culture in a school. They grow a community. They share things that have gone well and things that have not gone well. They make a difference. I am calling them Campfire Collaborations. Last week during our Faculty Meeting we shared some of these stories. We reflected, we connected, we collaborated, we listened and we shared our stories to develop our school culture. Tell a friend about that thinking move with your students. Tell a friend what type of thinking the students were doing?Tell a friend about how do you know they were doing that type of thinking? So we are going to ask you to stand up and move about. Find a some one to tell your story to. When you have told your story listen to there story. You have 3 minutes. When you have both got to the end of telling your story then decide if you want to keep your thinking move or swap it with your friend. You are going to have 3 opportunities to do this for 3 minutes each. It meant that every person in the room in around 10 minutes had heard 3 different stories that they could relate to, that they could connect with, that they could use again. The room was a buzz. The whole room was engaged in listening, sharing, learning, reflecting and connecting. It was awesome to see. Sharing our stories with our colleagues is such a crucial component to what we do as teachers. Stories are teaching. Teaching is stories. provide guidance for daily decision-making as well as the motivation that comes with the conviction that the organization’s work must go on. How do you make time for campfire collaborations in your school? What has got in the way of your learning today? And so the same is true of reflection for teachers too. In fact it is so important that we model these reflective techniques for the benefit of our students. It makes us self-aware and challenges our thinking. It helps us understand ourselves more as a learner, teacher and thinker. It helps us moving forward as a learner and thing about how best to help, support and learn from our colleagues. And reflection is not enough. We also need to share these reflections to a wider audience. We need to amplify our voice. We need to blog. But how do we build it into our workflow? Yes we are busy…But we manage to get school on time. We manage to be at class on time. We manage to go to meetings on time with colleagues or parents. So I think we should try to build it into our schedule. That is going to be my plan for the year ahead...I am going to try and use one period of my non-contact time to document, reflect and amplify my thinking. There I have written it down in this blog…so now I am accountable. I think it will benefit my students, myself, my colleagues and maybe some other people who read this blog. If it is not scheduled then it won’t happen. It will be interesting to see when my to do list continues to grow will I still stick to my pledge? I certainly hope so. Why? Because I really do see the value of documenting and reflecting on my learning for the benefit of my students learning. Blogging is a vehicle to help amplify my thoughts to help develop my thinking and improve my practice. How do we help our colleagues in starting and or continuing blogging? I think modelling, to our colleagues, that we value blogging as a tool to document and reflect upon our practice for the benefit of student learning. Making time, in our hectic schedules, to blog is a good use of time. It does impact student learning, it does give something back to our community of teachers ( both in our school and further afield) and it does move our thinking and understanding forward. I understand some teachers may not be ready to amplify their reflections. It will still be important to make time to document and reflect. Unfortunately deadlines drive our schedules and time. But I do think scheduling time at the end of lesson or a day take 5 minutes to reflect on what has gone well or what can be improved is vital, for the benefits of student learning. Write your reflections in your planning book, write them in a reflections book, but document them somewhere. When you are ready share these reflections with a close colleague. Some one who you trust. Good people. Imagine what would happen to education if we all took time to document and amplify our reflections? How are you going to fit it in? Are you not going to fit it in? Why do you blog? Why do you not blog? I would love to know you thoughts. What is the one thing that will make a huge difference to you and your practice over the coming school year? Who are the people who are going to push your thinking? Who are the people who are going to ask questions of your practice? Who are the people who are going to support you through the tough times? Your mind will probably fall on a couple of colleagues who are always ready to transform your mood, transform your thinking, push you to the next level. That is what we call the Marigold Effect, according to Jennifer Gonzalez, from Cult of Pedagogy. By finding the positive, supportive, energetic teachers in your school and sticking close to them, you can improve your job satisfaction more than with any other strategy. And your chances of excelling in this field will skyrocket. How true is this? I think it is true of any profession in the world: you want to be surrounded by people who can inspire you; can ask questions of you and will take you and your thinking to the next level. I know and believe this is true. There is an old proverb that reads “Show me your friends and I’ll tell you who you are.” Quite often we become like the people we’re around. Based on that, we must be cautious about whom we surround ourselves with because of the short- and long-term implications. And that is what we need to do in the coming year. We need to surround ourselves with good people for the benefit our students. The #COETAIL cohort ( both at ISL and online) have continued to meet and have been a constant source of inspiration and advice with regards to much Teaching and Learning and Technology. And there are many other like minded colleagues who over the past 5 years I have been lucky to work, to learn, and to grow with. I think it is so important that we as teachers surround ourselves with the good people who can make a difference to the teaching and learning that is happening in our learning spaces. However I think that one of the big game changers for me, and other educators around the world is technology. It has allowed us to connect, to collaborate, to communicate, to share, to learn with and from, to question, to expand, to change our thinking. This is something that I am likening to the Marigold Effect but Amplified. You see technology has transformed what we do, how we do it, and what we need to give to our students. But it has also effected how we share, how we reflect and how we grow as teachers. I think it has transformed the marigold effect. The classroom with out walls has (for teachers) helped to become the marigold effect without walls. It has connected like minded people to share ideas, to question and to push thinking. How? Let’s take this week for instance ( and school has not even started for me yet!). You see I have a community online too, as well as in my school. So here is what I have been inspired by this week as my thinking continues for the benefits of student learning. Some of it has been online from my Personal Learning Network ( Twitter, Blogs etc) and some of it has been face to face. So here goes, this is what has made me me grow this week…. Thinking about an awesome reflection from a Kindergarten Teacher about Attitudes, Dispositions, habits of Mind and Maths. Taken part in a global Flipgrid, about How I make my thinking visible after a provocation from Langwitches about Visible Thinking. Taken part in a great workshop from Ewan Mcintosh, from No Tosh. Found a wonderful idea for my class to take ownership on the ability to share their voice and thinking in the class for the upcoming year. So, yeah it’s important to surround yourself with good people. The people you surround yourself with matter (online and face to face). They generate the opinions, humor and points of view that your mind is continuously subject to. Over the past 12 years of teaching I have grown with the help of so many good people. Without those people my growth ( and hopefully theirs) would not have been possible. It is with this community — with their expertise, generosity, and talents — that I continue to grow. Surround yourself with good people and grow. Travelling Tales was my COETAIL course 5 final project. I can’t believe that it all started in November 2016. Time really has flown by. Travelling Tales has grown and grown in the past 8 months and has allowed students in my class to create meaningful and purposeful global collaborations. Not only has it created connections for my class but it has for other classrooms around the world, too. Traveling Tales has grown so much more than I ever could have imagined since that initial spark to design and create Travelling Tales. in 8 months there have been 14 Travelling Tales. 39 educators have signed up to take part. 15 different countries have taken part. 1 Tale was in all in French. 1 Tale was maths based. It is a project that has been so much fun to be part of and has allowed connections for students and teachers across the world. Each class completes a different part of the story, using Adobe Spark Video and then passes it on via Twitter or email to the next class. This part is a little like a digital campfire. It has allowed classrooms to continue to connect to each other after their Traveling Tale was finished. Classrooms have had Skype conversations and found out more about the students that they are collaborating with. The flat classroom. It has connected schools from across the world together and this post is a way of saying thank you to all the amazing educators who took a risk and signed their classrooms up to take part. There are too many to name here but THANK YOU to you all! Because without educators willing to give things a try, or take a chance then the project really would not have got off the ground. When you see a new idea or new project online it can be hard to sign up. How will this fit into the learning in my setting or classroom? How will it benefit the children? Well I really think that learning in such a way makes learning purposeful. It gives it meaning. It means that the learning goes further. The children’s ideas and voices are amplified to a larger audience. Global connections really do allow students to show their best work to a captured audience. Sylvia Tolisano (Langwitches) says it better than me. I think that this is the true beauty of 21st Century Digital learning. Taking learning to the next level. So, thanks to all of the Tribe of Travelling Tales. It really is much appreciated. Travelling Tales will return in a remixed style in August 2017. Do you want to amplify your classroom? Join us…. Please take a look at The Travelling Tales website for all of our Tales. These are the words of Tony Wagner, who has promoted educational innovation through his work with Harvard University, Keynote speeches and books. As babies we are finding out how things works. Why do babies put paper ( or any thing for that matter) in their mouth? It is to test it out. They want to know all about it. It is the natural curiosity in them to see what the object is. As toddlers we are constantly asking questions. Why? When? What? Where? Who? Again, it is the natural curiosity in toddlers. Our youngest learners in school are full of curiosity, innovation and creativity. When walking through Pre-school this week I saw this in full flow. Children were using see-through umbrellas to mix paint on. Another child was holding the the umbrella watching what was happening. It was great to see. My question to you is do your students ask those sort of questions? Do they show this natural curiosity? Are they willing to take risks? Try something new? Or has “the system” or school changed or re-wired this curiosity, creativity and innovation. What changes? Take a look at the cartoon, below, from Jean Marc Cote. Amazingly it was drawn in 1901 and it predicts a school in 2000. Is that what school is really like in the new millennium? Do we feed information to our students? Or are we inspiring, creating opportunities for innovation and creativity, creating a sense of awe and wonder? This week I watched an inspiring short film named Alike. In the short film directors Daniel Martinez Lara and Rafa Cano Mendez remind us of the importance of letting our children be children. It is 8 minutes well spent. Let’s be rebels. Let’s teach our children to be rebels. Let our students be open to life, to love, to art and to nature. Let them find the music and dance. Let them find the colours and paint. Teach them to share love. Give them the opportunity of creation, of imagination and adventure. How am I going to use it in school? I think the short film offers an opportunity to use as a provocation with students. It will allow them opportunities to think and discuss the type of learner that they are. What are there interests? It would be great to use at the start of the year and sow the seed that every child in the class is an individual whose opinion really matters. It could be used as an introduction to Passion Projects or Genius Hour. I think it could be shown to fellow teachers so that they can reflect on the type of learners that they are encouraging in their classroom. Where and how does the learning happen? Is it a one way process (like Jean Marc Cote’s cartoon) or are all members of the class involved in the learning? Is creativity limited and are students expected to produce the same work/learning ( like Paste was expected to in Alike)? Are children able to express themselves and play a violin? What do you like to think about? As I have collected more videos something really struck me about the answers to Question 2. What is happening in your head when you are thinking? However the children in the later grades ( ages 8-11) found the answer much harder to answer. They gave me more serious answers about the brain and the left and the right side of the brain. No I am not doubting that they are valuable answers but Why is that? Even with the opportunity to use their imagination some children find it difficult. Does school repress this natural reaction? Or Is it that the children by 8 years old have already lost that innate curiosity and creativity? We need to teach children the right values from a very early age. We need to understand what makes our students happy. We need to allow creativity and innovation in every classroom. Creativity brightens our souls and allows for new thinking and new connections. Schools need to allow time for students to practice these skills. These skills will help them in our changing world. Creativity, imagination and curiosity need to be built in to our Units of Inquiry/Learning. Teachers and leaders need to model creativity, in schools and classrooms, and allow for more opportunities for children to use their imagination and follow their natural curiosity. Is it the building or the school’s ethos or it’s Mission Statement? Is it the Curriculum or is it the equipment in the building? What is the thing that really matters…People. People are the best resource for any school in the whole world (or any other organisation for that matter). As George Couros explains People are always your best resource in schools. Well I think it is simple. Education is all about relationships. Is it the relationship that teachers have with students? Is learning something that happens one way only? Or are both teachers and students learning from and with each other? It is the relationship between students and students? Do they listen and communicate their thinking so that they can learn from each other? Is it the relationship between teachers and teachers? Are doors closed to classrooms and do teachers work in isolation? 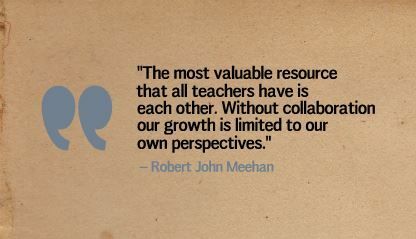 Or is there a true collaborative spirit where teachers are learning from each other to create the best possible learning opportunities for their students? It’s every relationship in the community. Not simply every relationship in the building, but every relationship connected to a school community. You see, I firmly believe that education is a social process. What does a kindergartner think about this? The results speak volumes. Children in my class are telling me, that even at the age of 5 or 6 years old they are understanding that they learn best when they are collaborating and when they are creating something. So, if education is social and built upon relationships then surely it is important that we work to support this in schools. How do schools help to build better relationships? I think that there are 4 key areas that schools need to continue to develop for the benefit of student learning. Communication – We need to be clear in our communication with each other. Being transparent with our colleagues and students can only help build trust and understanding with each other. Collaboration – We need to value collaboration. Understanding that working together makes us stronger. Working in a team means we can all have roles that suit us as learners and individuals. Teachers feel valued – We need to celebrate our success in the classroom and share the amazing learning that is taking place. Teaching is complex. Let’s make all teachers feel valued. Empathetic – We need to understand each others feelings and beliefs; their teaching style, their pedagogical approach, their uniqueness. if adults can work collectively and more effectively together, student achievement will go up. So what does it take to create a culture where people are valued? This past year, I have been working as one of 3 Activator’s of Thinking and Learning (ATL’s) in the Lower School to help create a Culture of Thinking. The eight cultural forces that Ron Ritchart discusses in his book Creating a Culture of Thinking are guiding us in this process. It is has been a great process and as a school we have made some big steps forward. There is more collaboration between staff members; we have created a pineapple chart to open up the doors to our classrooms. We have been communicating by documenting our learning and there are more collaborative discussions with groups such as COETAIL groups, Jo Boaler Maths Groups and Spelling Inquiry. Thinking routines are being used in classrooms across the school. Our physical environment is now a place for thinking and process not just product. Create opportunities for collaboration. Develop an in-house bank of resources for staff related to Cultures of Thinking. Encourage risk taking and sharing throughout the year. Develop greater capacity among staff to share. Create Cultures of Thinking connections with the Professional Growth Model learning groups. Model risk taking, collaboration and reflection through weekly blog posts on the Thinking at ISL blog. Looking at these goals, many of them fall into the categories of collaboration and communication. If we are to be successful in meeting these goals then also teachers need to feel valued and have empathy with one another. Posted byJoel Bevans May 19, 2017 Posted inPost-CoetailTags: collaboration, communication, community, cultural forces, Culture of Thinking, empathy, social, valued7 Comments on What makes a school? How many times in a day do we see the colour blue? Other than sky, there really isn’t much in nature that is inherently a vibrant blue. It’s not a colour that you instantly notice. That is certainly because rather amazingly blue is a relatively new colour. The first society to have a word for the colour blue was the Egyptians. From then, it seems that awareness of the colour spread throughout the modern world. Is it that people did not see it? or is it that they didn’t look closely enough to the different contrasts in colours? I suppose what I am talking about is looking at details in your surroundings. Slowing down and really thinking about the similarities, differences, meanings, changes etc. This is pretty similar to the journey of Paul Salopek, who is currently taking part in a slow walk called Out of Eden. Paul is taking time to slow down and notice the meanings, the changes, the trends. I recently completed a course from Project Zero about Making Learning Visible and I am discovering that through careful observation and documenting learning can change the nature of that learning. when we make documentation part of our learning process, we become more aware of details and nuances, we reflect deeper, we learn more about ourselves as learners and make thinking and learning visible that otherwise would have been hidden under the surface. This is not done as an add-on, but becomes deeply ingrained in the learning process. Documentation can serve different purposes during different stages of learning and context. It not constant but changes depending upon the particular context it is used in. One thing that is constant is that it prompts questions and conversations. It also adds a deeper level of complexity to deepen and extend learning for learners and educators. Documentation is guided with a specific question that guides the process. As mentioned above a way of documenting is through images. Silvia Tolisano shared a great idea in trying out documenting with her 1-Day Blue Photo Challenge. The challenge is relatively simple with greater layers added into it with the reflection element of what has been captured. For one day notice all the blue in the world around you. Taking as many photographs throughout the day. At the end of the day choose one image that you feel represents blue. Then amplify your documentation by sharing it on social media ( Instagram/ Twitter) with the hashtag #documenting4learningblue. Finally reflect on what you have posted by writing a comment explaining your thinking. Here is my photograph, of a piece of art in my school, that captured my thinking at the end of 24 hours. It not only has many shades of blue that I liked but when reflecting I felt the waves added extra layers to the blue. Bringing new meaning and complexity each time that they come crashing in…a little like the sea itself. I was amazed at how much blue there was around me. It was everywhere. When I switched on to the lens of focusing on one colour it was hard to see anything other than blue. Talking a walk through school at lunchtime I took photo after photo. Time and time again I stopped and took a quick picture, capturing the blue all around me. Would I have noticed this with out the lens/focus ? Reflecting further it was intersting to see the many varieties of blue, light blue, sky blue, dark blue, royal blue, petrol blue. You name it I saw it. Like Tina Zita in her blog post I began to question if “this shade qualifies as blue”. I think that this comes back to the point about slowing down to notice these things and also giving yourself time to process and think about these questions. Learning to look with a clear focus in mind also sharpens the thinking and documentation. Blue has always been my favourite colour. It is the colour of my football team, it is one of the colours that I wear the most. I like the colour blue but this challenge allowed me to think and look about blue in a different light. It re-focused my thinking and my observations. Documenting with a clear focus has allowed me to observe more and think more about the colour blue. What could documentation do in the classroom? We are able to share thoughts and ideas about anything and everything with the click of a button. It is so easy to share these days and we all do it. We share our thoughts about a variety of subject areas from the weather, the food we are eating, music we are listening to, films we are watching, and the places we are going. You name it we share it. Social media has allowed us to share our voice with a captive audience. Facebook, Snapchat, Twitter, and Instagram ( just to name a few) have changed how we share information with others. To reveal valuable and entertaining content to others. To define themselves to others. To grow and nourish relationships. To get the word out about brands and causes they like or support. The info-graphic below shows a little more of that data. My thoughts turn to education and educators sharing what is going in the classroom. Is it as easy for educators to share what is happening in their classrooms ? Why is that we go back to our inner 2 year old self when it comes to sharing our practice? To put it bluntly teachers find it hard to share what is going on in their classroom. It doesn’t seem to matter who they are sharing with (colleagues in our schools or further afield). It is hard to share. This is the opposite to the findings above. Which is strange isn’t it? It is strange because it is the exact opposite of what we as teachers expect from the children. We want children to be able to share; this is one of the first things that we do in Pre-K and Kindergarten. Share ideas, collaborate with others, connect. And it the exact opposite to what we are doing online privately. But as Dean Shareski expertly explains it is our Moral Imperative to share. Ask Questions: Create a list of questions to ask for a couple of lessons every week. Videotape yourself – Watch yourself and think about what would do better next time. What type of language did you use? Did you give children time to think? Now I am not saying that everyone needs to blog, there are many ways we can be reflective.What I am saying is that sharing our practice through a medium may mean that our reflection is amplified. Silvia Tolisano (Langwitches) discusses this further when she says we must amplify reflection. Blogging does not have to be the only way to amplify these reflections ( why not try Twitter and Instagram as a way of quickly sharing what is going on in your schools or class) but I do believe that sharing our thoughts and documenting what is going on in our classrooms and schools allows for greater opportunities for us as educators. Which allows for more opportunities for the students we work with. To reveal content to others. To get the word out about ideas, things we are trying out. After all, Sharing is a Teachers Imperative. I am going to leave it with George Couros when he says. There is so much we can learn from one another. We need to continuously work to create the culture and environment where sharing is the norm and learning is transparent. How do you share and reflect? When creating this video, I thought it would be challenging to make 10 minutes’ worth of video content. As it is the video is over 10 minutes and there is still things that I did not put in! How did that happen? I think my project really helped me! Essentially the project is about children creating a story or Tale in a video format – so in the video you will see examples of the children’s work along the way. Create some branding which you will see in this post and in the Project Video, so that Travelling Tales has a sense of identity. The process of making the video began with creating a storyboard. I decided to use Google slides for this because I thought it would allow me to manipulate images and words. In the end I did not use images in my plan. I don’t know why but it just happened that way. Instead what you see is me writing down my thoughts and ideas – a little like a script. I thought iMovie would be the best tool for me to create my Project video and after cutting videos, adding voice overs, putting transition slides in etc. For a whole day I had only ended up with about 4 minutes’ worth of video. I was slightly depressed by the whole thing. I even showed it to my wife who wasn’t too complimentary! Not good. So after a little soul searching and a lot of thinking I changed my approach. The children during the project use Adobe Spark Voice to share their stories. Why can’t I do the same? And that is what I did. I used the same tool the children used for their project in my project. I still used iMovie to cut and slice it together but I think it’s pretty cool that I used the same tool to tell a story or Tale as the children. So here it is Travelling Tales. A COETAIL course 5 Final Project by Joel Bevans created using Adobe Spark Voice and iMovie. As I said at the start there is work and evidence that did not make the final video otherwise it would have been a COETAIL epic (a Steven Spielberg hour long effort!!) So here are few more pieces of evidence of my Project. There have been four Travelling Tales so far. The first one is part of my Project Video but here are the other three Travelling Tales. Travelling Tales will continue. I am just in the process of sorting out the next Travelling Tales and it looks like we may have 3 Tales happening simultaneously. But we are always looking for more classes to connect with. If you would like to join Travelling Tales, then please sign up here. And that is that. My last official COETAIL blog post. But I will be back. I will not go back to my old ways of being a lurker. No I will continue to try to be Comfortably Uncomfortable. Because that is what COETAIL does to you – it pushes you to that space where you learn, develop and connect. COETAIL has changed me. There have been occasions that I have loved it. Times I have not liked it too much. But change is not always supposed to be easy is it? I think it has pushed me to continue my development in to good teaching practice and to find tools ( technology based or not) that transform the learning to previously uncharted territory. COETAIL has pushed me into the zone of Comfortably Uncomfortable for my professional development. This area of Comfortably Uncomfortable is the same area that we want our students to be in when they are learning. It means that they happy and feel supported but it is really pushing them to the next level of understanding. That’s what I feel COETAIL has given me. It has pushed me to the next level. Given me help and guidance when needed, given me freedom at times. Now I am not saying that I am ready to change the world. But COETAIL has given me tools to continue my personal growth. It has allowed me to try out things that I have wanted to do for ages but never made the time. It has given me personal and meaningful connections in all areas of the world through my PLN – I haven’t even met or spoken to most of my PLN but I feel a connection with them and know I can continue my learning adventure with their support and ideas. It has given me a voice, a purpose to reflect into my learning and the thinking and learning that is going on in my classroom. Moving forward I will continue to blog, I will continue to make connections with other educators around the world, will continue to try out new things and try to reach that space again. Thanks for pushing me into that zone COETAIL. When are you in that zone? I would love to know your thoughts.